The genus Hippeastrum is composed of several species known the world over as 'Amaryllis'. This has led, unfortunately, to some confusion since another plant exists with the genus named 'Amaryllis' (it contains a single species called Amaryllis belladonna). Both are bulbous plants from South Africa but where Amaryllis belladonna has 6 to 12 smaller flowers on a solid stem, Hippeastrum have 4 to 6 large flowers on a hollow flower stem. 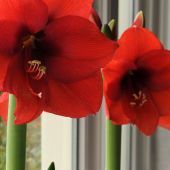 While they can be planted outside in the semi-tropical climate of the deep South and South-West (best to plant them in Spring) most Hippeastrum are available and sold in late Fall for indoor growing during the Winter months. Choose a deep pot that is not more than 2" (5 cm) wider than the bulb itself. Using a good potting soil, plant the bulb so that the upper 1/3 of the bulb is above the soil level. Water sparingly at first then more generously as the flower-stems develop. Place in a bright location at normal room temperature of 68F (20C). With this constant warm temperature they will bloom within 8-10 weeks. 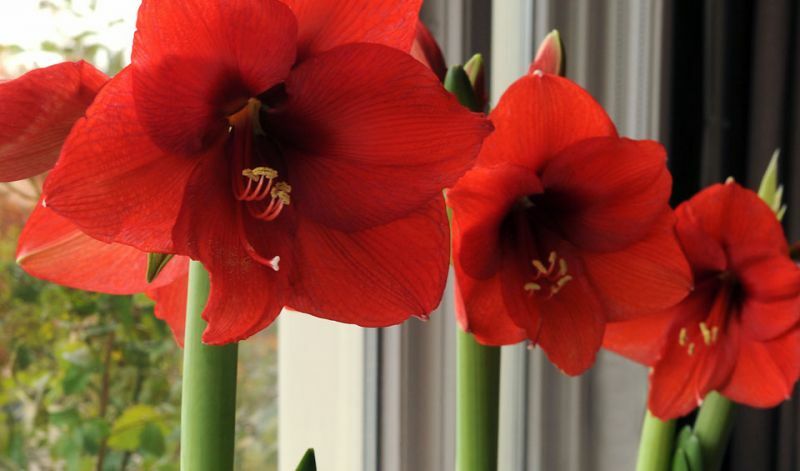 (If you definitely wish to have them in bloom for Christmas look for the specially prepared & labelled "Christmas Amaryllis" which will bloom within 4-6 weeks after planting). If you want to try and keep the bulb for next year you have to do the following: after all flowers have faded, cut down the stem to just above the nose of the bulb but leave the foliage. Continue to water moderately and fertilize it once a month. During the Summer you could plant the bulb (and inner pot: best not to disturb the roots at this point) outside in a bright spot in the garden. Keep watering and fertilizing it. Early September cut off any remaining foliage, dig up the pot, remove the bulb and carefully clean the soil from the roots. Then store it in a paperbag in a cool 55-60F (13-15C) dark place for 10 weeks. Mid November you can start growing your bulb all over again.